Love caramel? Well then listen up: Caramel Popcorn Day is just around the corner! But instead of sticking solely to caramel popcorn recipes (like caramel sticks to your teeth) we’ve included some of the sweet, salty, chewy, and delicious caramel recipes we could find. Try not to rot your teeth our and tick off your dentist when you make some of the following foods! 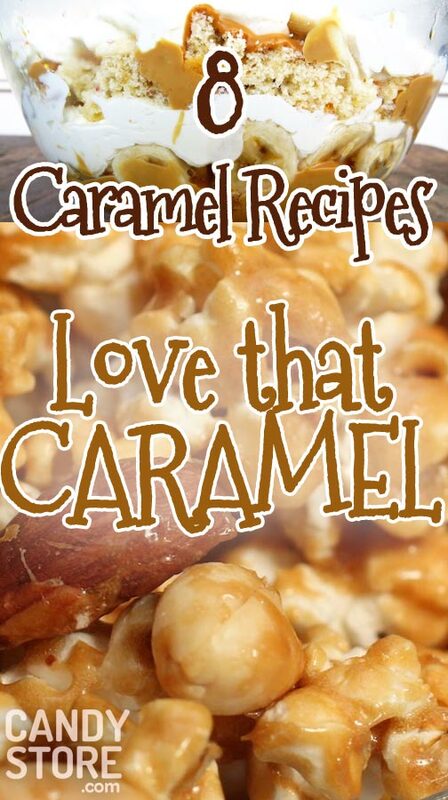 It is Caramel Popcorn Day after all, so we had to include a caramel popcorn recipe! This one is completely homemade and super delicious. Beware, the host warns that this is so good you’ll eat it all in a couple days… we believe her! Caramel’s buttery, salty, and savory nature is only heightened by nuts—especially almonds. As long as no one has an allergy, load up your homemade caramel popcorn with a handful of your favorite nut. Here’s a hint: try chocolate covered peanuts or almonds for an incredible flavor combo! Caramel buttercream frosting is insanely good. It’s worth making caramel yourself too! The one thing you need to remember with making caramel at home is never to take your eye off of it. The seconds in which it turns from a sauce to a firmer caramel happen quickly and you don’t want it to burn. This baker does a great job of explaining how to make this caramel cake, but we have some pointers too. Always make sure caramel is cooled completely before adding it to frosting or you’ll have a gloppy mess that will run off the cake. Also, wear long sleeves when you add the cream and butter because the caramel will bubble up like an angry volcano. Besides that, have fun baking and eating this incredible cake! If you’ve been hunting for a soft, chewy cookie recipe loaded with delectable caramel, you’ve found it. This recipe is one of our all-time favorites. Making your own caramel for this recipe? Make extra to save in the refrigerator to put on top of cakes, drizzle across ice cream sundaes, and eat by the spoonful. Homemade caramel sauce also makes a fantastic gift, so can some to dole out to friends and family members for special occasions. A rose by any other name would smell as sweet—and the same goes for caramel. This caramel custard also goes by the French names, flan and crème caramel. It also goes by the names delicious, spectacular, yummy, and addictive. Want to master an easy, yet impressive dessert for dinner parties? This is the one. It’s so creamy, savory, sweet, and amazing. Your friends will be taken aback by your culinary talent and you’ll love hearing all the compliments. Sweet, salty, and chewy caramels never go out of style. Learn how to make your own by watching this drool-worthy video. We probably don’t need to tell you this, but caramels are a sticky substance. If you want to be able to enjoy these in one piece, use a greasing agent like butter or crisco on top of parchment paper before you pour your cooled caramel. Once it’s completely dry (chilled in the refrigerator or freezer), then you may cut your caramel squares without fuss. Chocolate and caramel, we love you two together! Especially in this wonderful chocolate caramel tart. If you don’t have a tart pan handy at home, it’s time to treat yourself. Springform pans also work great and make for easy removal if you want to rest your pie on a pretty plate instead. We recommend serving this tart with ice cold milk or bitter espresso. It complements the salty, savory, and sweet flavors divinely. This recipe is like the unbaked banana’s foster—a.k.a. sinfully yummy! If you have a trifle dish or a nice glass bowl you can make this caramel banana trifle at home to celebrate Caramel Popcorn Day. Or try this salted caramel brownie trifle recipe instead. The key to any trifle is never letting the ingredients run together. It’s okay to get a sedimentary effect with a little dribble here and there, but don’t stir! Your guests will want to see each ingredient in its own tasty layer before they dig in. Caramel apples are a bit hard to eat. That’s why we love this adaptation: caramel apple cinnamon rolls! Follow this recipe to get all the flavor of this classic carnival treat but without any of the sticky, teeth-breaking hardness. You can always make this cinnamon roll recipe the night before Sunday breakfast or a big family brunch. Then wake up before everyone else so they can rise to a nice surprise! Looking for even more caramel gooeyness for Caramel Popcorn Day? Take a look at the stash we have waiting for you.